After the PV market underwent a period of oversupply, prices have gradually hit rock bottom since 2013. Increased market demands will support prices from dropping further. Also, in the short run different supply chain segment costs have entered a bottleneck. Demand will still grow in 2014 and all first-tier manufacturers can maintain higher utilization rates in the entire year, noted EnergyTrend, a research division of TrendForce. In addition, the US-China anti-dumping and countervailing issues¬¬ will continue to affect the production utilization of Chinese and Taiwanese manufacturers. Overall, having wide regional market strategies is key to success in 2H14 for polysilicon to module manufacturers. Mainstream polysilicon price is still around US$20-25/kg. Wafer manufacturers cost is differentiated through small or large manufacturers contract prices, the use of auxiliary materials and exchange rates. 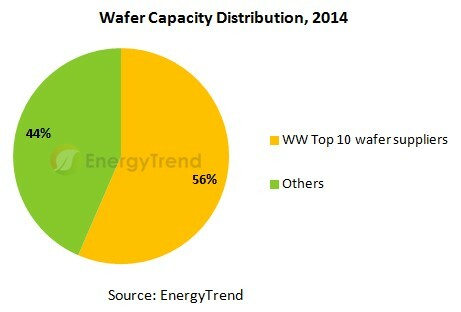 Since the wafer industry’s concentration is more obvious than other segments within the supply chain, many vertically-integrated manufacturers have decided to raise wafer production for their own consumption to reduce outsourcing percentages. As wafer prices are revised upward in 1Q gross margin can reach 5%-10%. Yet, limited by economies of scales, gross margin for manufacturers with lower manufacturing capacities is around 2%-5%. Price is likely to be further revised downward in 2Q, and thus further compressing small-scale manufacturers space for survival and leading towards the trend of first-tier manufacturers continual expansions. Impacted by the anti-dumping and countervailing issues, cell cost remained high in Q1. “Taiwanese manufacturers’ gross margin is about 2%-5%, but there may be room for further price upticks, due to paste and wafer price adjustments. Although, Chinese already have low cell costs, the module segment will be most profitable because Chinese manufacturers are mostly vertically-integrated. In the long term, cell profitability will be affected by upstream and downstream module exports, resulting in passive cell price trends,” added Huang. Major module manufacturers have started to turn losses around since 2013. Apart from lowered costs, module prices remained stable because of strong demands. Moreover, if vertically-integrated Chinese manufacturers profits all shift to module segment, gross margin can reach 15%-20%. For now, 250W module sales price is US$ 0.54-0.68/w. However, there are relatively large price differences in the markets.